What makes a whisky great? Is it the barley used during production, the pot stills used to distil it, or the quality of the water taken from the earth? Put simply, all of the above contribute greatly to the dram in your glass, however, many experts suggest that the casks used and period of maturation has the greatest impact on the final flavour profile of a whisky. So, as one would imagine, any whisky distillery worth its name has a very strictly monitored method of managing the wood they use to age their products. The better the wood strategies, the better the expressions created. As the largest whisky producer in Japan, Suntory has put extensive thought, passion, and dedication into the way they handle their casks. They put Japanese whisky on the map and played a huge role in giving it the globally renowned status it enjoys today. All this was accomplished by paying attention to every last detail in the whisky maturation process, to monitor how a dram progresses over the years, as the oak works its magic. 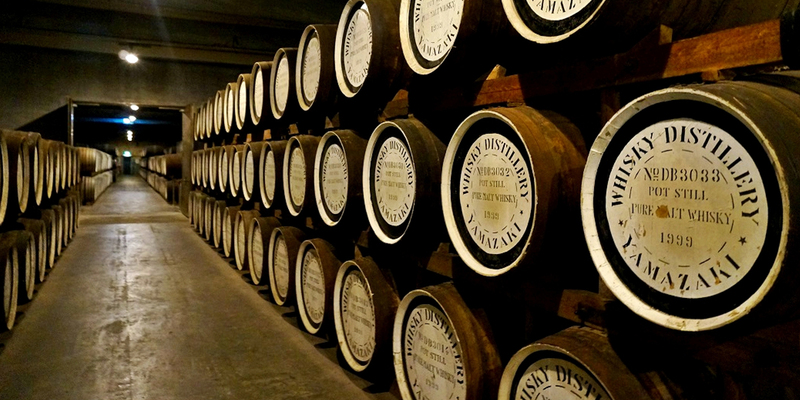 Enter the glorious cask management of Suntory. Shinjiro Torii, the founder of Suntory, wanted to create casks in house, however, there was no tradition of cask making in Japan at that time. Nonetheless, Torii hired a tub make called Gennojo Tateyama as the first cooper of the Yamazaki distillery. Tateyama taught himself to make casks by studying imported ones, and passed his skills on to his son, Noboru, who then passed them on to his son. For this reason, the cooperage at Suntory was created using unique self-taught skills, differentiating it from other cooperages across the globe. The Ohmi Aging Cellar is located around forty miles northwest of the Yamazaki distillery, and holds most of the spirit produced at the distillery. Built in 1972, the so called cellar has expanded greatly over the years, and now houses multiple warehouses, filled with casks. After almost twenty years the Yamazaki cooperage was also moved to the Ohmi complex. Suntory also has large warehouses at Hakushu and a few at Yamazaki, meaning that in the case of a natural disaster, all the company’s stock won’t be destroyed. The different climates of the locations also impact whisky maturation differently. Suntory’s cask strategies have been created to monitor each and every step of the wood’s handling: starting at the tree, all the way to the time it’s bent into a cask. Ex-Bourbon – Getting ex-bourbon wood is no issue for Suntory, since 2014 saw the company become Beam Suntory, after the acquisition of Jim Beam. Barrels and hogsheads are used, with the capacity of 180 litres and 230 litres, respectively. These are made using staves from previously broken down barrels. Check out this awesome Yamazaki Bourbon Barrel to get a taste of what we’re talking about! Ex-Sherry – The sherry casks used are always made out of Spanish oak, and are created by trees hand-selected by members of Suntory, who travel to Spain yearly to view the trees. The trees are cut, left to air-dry for 3 years, coopered, seasoned for another 3 years with Oloroso sherry, until finally being sent to Japan. It’s long process, but Suntory believes the quality of the wood is more important than the type of sherry the cask previously held. They must be doing something right, as many of their sherried bottlings have been globally awarded for years. Jim Murray called the Yamazaki Sherry Cask 2013 the best whisky in the world. Coincidence? I doubt it. Ex-Wine & Ex-Umeshu – Suntory owns Chateau Lagrange in the Bordeaux region of France, giving them huge access to ex-wine wood. Check out the Yamazaki Distiller’s Reserve for the notes berry created by the wine. Suntory also produces umeshu (Japanese plum wine) and has used umeshu casks to age certain expressions, in an attempt to create the distinctive plum note found in blends like the Hibiki 12 year-old. Mizunara – Suntory specializes in mizunara oak, which grows very slowly, making it very scarce and expensive. Luckily, Suntory has access to some forests in Hokkaido, but to allow the forest to regenerate, rights are often suspended for long periods of time. Suntory casks are usually used for 50 to 70 years, before they are retired and turned into furniture, which Suntory also sells in their Suntory House in Osaka, Japan. Blenders decide when a cask has grown too old to be refilled, and that is when the cask is brought out of production. The oldest cask maturing at Yamazaki right now is from the 50s and will be retired after the whisky is taken out. In a way, it’s the whisky circle of life and even though the wood was cut long ago, it still works relentlessly to bring us the wonderfully matured whisky we all enjoy. Let’s toast to the wondrous work of oak.